According to the Bureau of Labour Statistics, the demand for qualified Dental Assistants is on the rise, with a 19% increase in job roles expected over the next ten years. The stats suggest there are an increasing number of Dental Assistant positions to be had, but applying for them when you have only just graduated can be a daunting task. Here at Northwest Career College we are committed to finding you the Dental Assistant role of your dreams, which is why we’ve put together these tips on how to find your ideal dental assisting job. Write A New Resume – Many of the graduates from our Dental Assisting School are adult learners who have worked in varied professional careers before coming here to qualify as Dental Assistants. 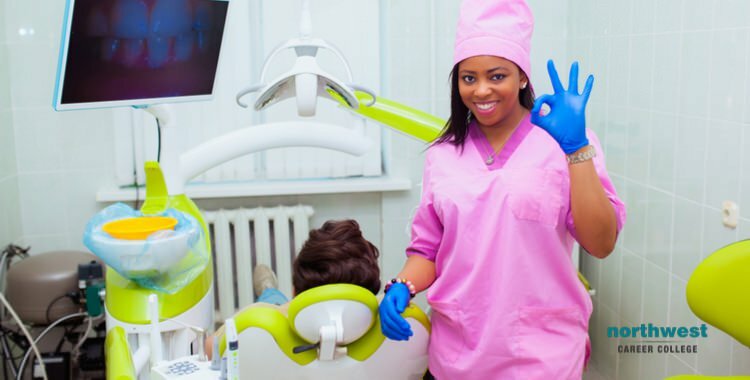 When you are applying for Dental Assistant jobs, rework your resume to highlight the key skills and experiences that you think will contribute to you getting your new role. Simply adding your newest certification to the top of your resume might not be advertising you as strongly as possible to potential employers. Network – LinkedIn is your friend when it comes to finding a Dental Assistant position, allowing you to connect with, and reach out to everyone you met while you were training and on your externship. But LinkedIn isn’t the only way to network. Reach out through your friends and family, use other social media like Twitter, Facebook and Instagram. The more connections you build, the more likely it is that one of them will find or offer you your perfect position. Prepare – Good preparation is vital when it comes to applying for, and interviewing for, Dental Assisting positions. Your externship will allow you to see what it is like to work in a real dental practice. Use this time to build and understand of what size and type of practice your prefer, this can help narrow the focus of your applications. It’s also a good chance to do more networking. When it comes to interviews, do your research. Find out about your prospective employer and their mission statement, then tell them how you can help them achieve their stated goals, it will set you apart from more passive applicants. Use Our Career Services Team – Our committed job placement team is here to help you find the position you want. Based on campus, Northwest’s Career Services team works with you to help you find the best Dental Assisting employment opportunity in Las Vegas. In addition to our 91% national exam pass rate we are also proud of our 80% job placement rate for our Dental Assisting graduates. Here at Northwest Career College we firmly believe that learning is a process that continues on the job. Our Dental Assistant Training Program gives you all the key skills and experience you’ll need to find the best dental assisting employment opportunity in Las Vegas. Our Dental Assistant School offers morning, afternoon and night classes to accommodate your busy work and family schedule and our established, seasoned instructors have helped our students achieve a 91% national exam pass rate. Call us at (702) 403-1592 to speak to one of our admissions assistants about your new dental assisting career.